“I’m fairly surprised,” Alberta Energy Minister Marg McCuaig-Boyd said of the widespread enthusiastic touting of CCS investments at CERA Week, an important Houston energy conference organized by IHS Markit at the beginning of March. Alberta had once been an enthusiastic investor in CCS projects and committed $1.3 billion to two projects in 2014, which at the time accounted for 10 per cent of the total global investment in carbon sequestration. But the technology was considered too expensive relative to other emissions reduction strategies and further investments in CCS in Alberta were abandoned. “Right now, there are technologies out there but it’s very expensive,” McCuaig-Boyd said. Alberta has since wound down its $2-billion fund for CCS investments, citing the high costs. But now some of the world’s most influential oil executives are touting CCS – now rebranded as carbon capture, utilization and storage (CCUS) – as a way to reduce global emissions. Apart from Shell CEO Ben van Beurden and BP chief executive Bob Dudley, the boosters include International Energy Agency executive director Fatih Birol, U.S. Energy Secretary Rick Perry, Norway’s Minister of Petroleum and Energy Terje Soviknes and others. “This is an extremely important technology and we have seen recently a strong interest here,” Birol said of CCS, which he said is “critical” for energy-producing jurisdictions meeting their climate change goals under the Paris Agreement. “There are plenty of questions (facing the energy industry) but the biggest one of them is still, in my mind, climate change,” van Beurden said, adding that further investments in CCS/CCUS could be part of Shell’s strategy for reducing its net carbon footprint by 50 per cent by 2050. The 2018 U.S. federal budget includes tax credits of up to US$50 per tonne for captured CO2, a move which IEA analysts believe will boost the total amount of CCS/CCUS capacity around the world by 66 per cent by 2026. Right now, CCS facilities around the world capture 29 million tonnes of CO2 per year – and projects in both Alberta and Saskatchewan make a large contribution to that total. With $745 million in funding from Alberta and $120 million from Ottawa, Shell Canada Ltd. built the Quest CCS project at a bitumen upgrader near Edmonton, which reduces the upgraders emissions by 35 per cent and has the capacity to sequester 1.2 million tonnes of CO2 per year, the equivalent of 250,000 cars, at an estimated cost of $1.35 billion. The technology’s high price tag has made it a controversial method for reducing emissions and there were some initial performance issues at the sites where it has been installed. SaskPower’s $1.5-billion Boundary Dam CCS project at a coal-fired power plant near Estevan, Sask. uses nearly identical technology as Quest – SaskPower purchased the system from a Shell subsidiary – and is sequestering less than its designed capacity. The provincially-owned utility announced Monday it had sequestered 2 million tonnes of CO2 since the project became operational in Oct. 2014, which translates into a carbon capturing rate of approximately 585,366 tonnes per year, compared to initial design estimates of 1 million tonnes per year. SaskPower spokesperson Jonathan Tremblay says the company’s target is to operate at 65 per cent of the CCS project’s design capacity because it sells a portion of its design capacity to a third party, which uses the CO2 to stimulate oil and gas wells, and sequesters enough to meet those obligations. “In our first year of production, we learned a lot,” he said, adding the company did experience some inconsistent performance from the technology when it was first installed. The Boundary Dam project has also been criticized for being so expensive as to be uneconomic. Still, Switzer said CCS or CCUS investments could make sense in other applications, such as steel mills or pulp mills that are expected to operate over a longer period of time so the high initial investment can be recouped. “We do need to work on bringing the costs down and making the technology more viable,” he said. Still, other jurisdictions are moving ahead with new CCS instalments, including NRG Energy Inc.’s US$1-billion Petro Nova CCS project at a coal-fired power plant near Houston and new facilities in Europe. “It is not a big contradiction between being a big producer of oil and gas and having ambitious climate policies,” Norwegian energy minister Terje Soviknes said at the Houston conference. Norway, which produces oil from the North Sea, is considering further CCS investments including at a cement plant, an ammonia plant and a waste-incineration plant. He said other jurisdictions should also invest in CCS research and deployments in a collaborative approach. In his speech at Houston’s CERA Week conference, U.S.’s Perry touted the U.S. commitment to CCS technology to reduce emissions while growing its oil production to exceed that of Saudi Arabia’s. “America is in the middle of an energy revolution,” Perry said, adding that CCS would allow that revolution to continue while reducing emissions, rather than oil production. In Alberta, the province’s NDP had campaigned on a promise to back out of all CCS investments but did not follow through once forming government as the contracts the previous Progressive Conservatives signed were binding. 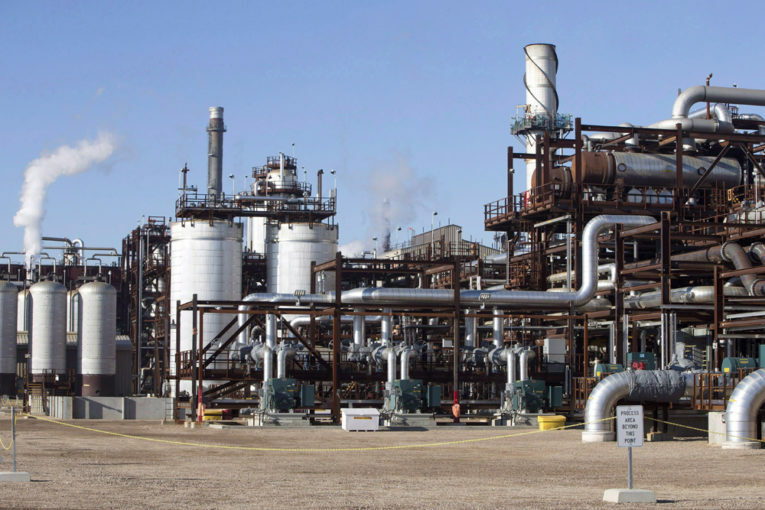 Despite the oil industry’s renewed fascination with CCS, the Alberta government says it has no plans to revisit its defunct CCS fund but McCuaig-Boyd said the province is willing to consider new technologies as they emerge. “Economic Development and Trade has launched a carbon prize, so I can see that there might be some projects come through that – ways to use that carbon,” McCuaig-Boyd said, but indicated that would be as far as the provincial government would be willing to fund CCS investments at this point. “If someone comes up with a good use for carbon, I don’t think the door is shut on that,” she said.